Due to our extensive research work, we have been able to provide our clients with effective and safe to use pharmaceutical formulations in a best possible manner. 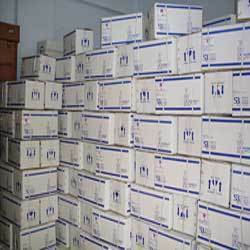 To ensure proper storage and packaging of our range of pharmaceutical medicines, we have a spacious warehouse and packaging unit, where our medicines are stored in a systematic manner. Our warehousing unit is properly sectioned that facilitates easy storage and retrieval of our medicines as well as enable our on-time delivery of the consignment. It is hygienically maintained and has controlled temperature to ensure safe storage of our pharmaceutical formulations and tablets. Further, we pay utmost attention to the packaging of our products. These are packed in quality and reliable packaging material such as aluminum foils, boxes, PVC films and corrugated boxes so that these can be delivered to our clients safely. Moreover, these medicines are also labeled and sealed to avoid any kind of tempering.